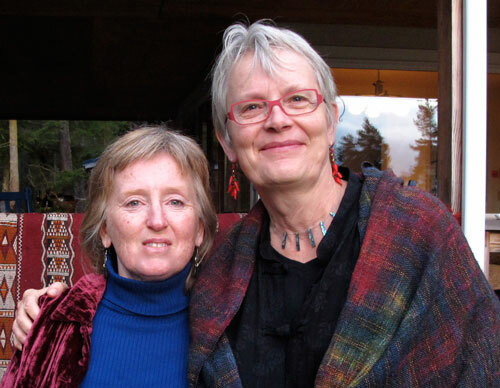 Sandy Bishop and Rhea Miller began to incubate the idea for the Lopez Community Land Trust in 1989 in response to a jaw-dropping 189 percent escalation in housing prices on the island in that year. The two had met on a peace walk across the country in 1984 and thereafter moved together to Lopez where Sandy was already making her home. They were both hardworking, a little on the scrappy side, and used to organizing events and keeping an eye on social justice issues and jumping in with both feet when so moved. They lived on a friend’s land awhile, rented, and eventually bought a five-acre parcel on Lopez that they share with another couple. “We felt we were all going to be upscaled out of here,” Sandy, executive director of LCLT, recalls, “and we were looking for solutions. The vital link between emergence and community was something that Rhea had studied deeply, beginning with her exploration of the work of physicist Fritjof Capra and the Center for Ecoliteracy, which he cofounded. “I had been doing a lot of research in the new sciences (the whole is greater than the sum of its parts), where I found a lot of material about system’s theory from the viewpoint of biologists and physicists,” she explains. "I particularly came to appreciate some of the work of biologist Lynn Margulis who said that you cannot have an individual without first having community." To say that they met resistance creating Morgantown—LCLT’s first affordable housing project—would be an understatement. “At the time the island was deeply divided and we were the most hated organization here,” says Sandy. “The pharmacist had a secret petition he kept under his pharmacy desk to sign against us. There were all kinds of rumors and innuendos. Some people were convinced we were going to drive down their property values. It brought out the worst in people.” In fact, in the face of this fierce opposition, the Washington State Housing Trust Fund declined LCLT’s initial application for funding. Morgantown was to be the first of five affordable developments built by LCLT. It was followed by Coho in 1995, another seven-home development; and in 2003, by Innisfree, an eight-unit development that included rain catchment tanks for garden use and passive solar features. Thereafter LCLT really began to raise the bar on the “green” elements of project design and technology. Its goal with Common Ground—a mixed income group of 11 homes, 2 rental units, and an office/resource center, completed in 2009—was to create a net zero energy development. Four of the development’s homes now meet that goal. Common Ground featured straw bale construction with lime render, rainwater catchment, evacuated-tube solar hot water, and a grid-tied solar electric system. LCLT shared the design principles and technologies behind Common Ground by publishing a manual of instruction: Land, Water, Energy, Resource Use: A Systems Approach: Understanding Our Fourth Affordable Housing Development. Tierra Verde, LCLT’s latest development, completed in 2012, is a group of four houses, also designed to be net zero. It has many of the features of Common Ground but instead of evacuated-tube solar to heat water, Tierra Verde uses heat pump technology. Hear Rhea Miller read an excerpt from her book, Cloudhand, Clenched Fist, describing the remarkable emergence of the Lopez Community Land Trust. For each of LCLT’s developments, homeowners, along with volunteers and interns recruited locally and from universities, contributed sweat equity. This not only drove down building costs, it also gave homeowners an opportunity to acquire the requisite skills to perform ongoing home maintenance. “We had a woman with a nail gun up on a roof who had never before even held a tape measure in her hand,” Rhea recalls. 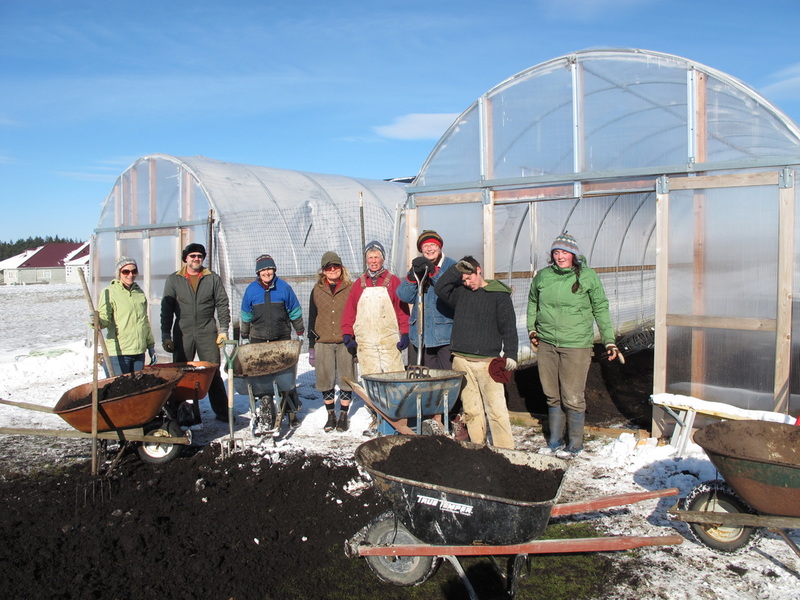 Sweat equity drove down building costs and helped build trust among a group of strangers who would together become shareholders in a cooperative housing development. An appreciation picnic/bbq dinner around the campfire, honoring LCLT interns, and hosted by LCLT Board members and staff. LCLT ensures that the homes on its land will remain affordable in perpetuity through a ground lease. Each homeowner then purchases shares in the cooperative and pays for them with a combination of sweat equity and a cash down payment. If the homeowners decide to sell their shares, the sale price is calculated based on the initial purchase price plus an amount representing between 3 and 5 percent simple interest rate per year. If an improvement is made to the home with the cooperative association’s approval, that value can also be added to the sale price. However, the shares cannot be sold above a specified cap to ensure affordability for the next buyer. When asked to describe the essence of LCLT, Sandy sums it up by saying it is about unleashing the power of community. “Our interns often say to us that they had never lived in community before. We have a strong sense of it here on the island and we feel the Land Trust has a major role in creating it." LCLT is also about unleashing the power of entrepreneurship. 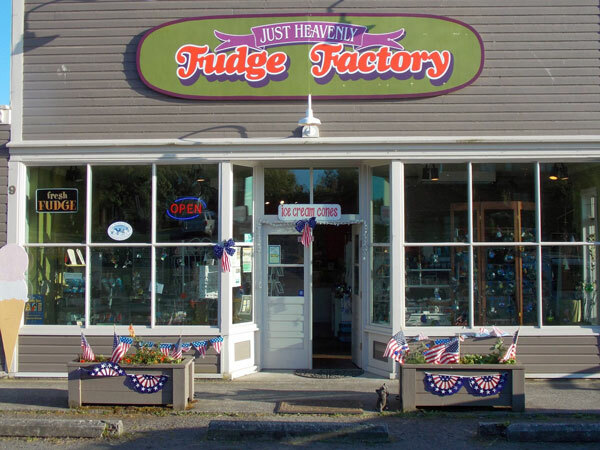 The Just Heavenly Fudge Factory is owned by two Common Ground residents, Marjoe Davidson and Natalie Wilson. In addition to her work with LCLT, Michelle is now the owner of a dog training business. “I had always been interested in dog training but knowing I was getting settled in and would have a place we wouldn’t be moving around from allowed me to go to a school to get certified,” she explains. Audrey, who works as a landscaper, now owns a sheep flock (tended by a shepherding dog trained by Michelle), and sells meat and fleece to augment her income. “We have our secure jobs, and then the sheep and dog training are our endeavors we love that we got working on after we moved into our own home,” says Michelle. 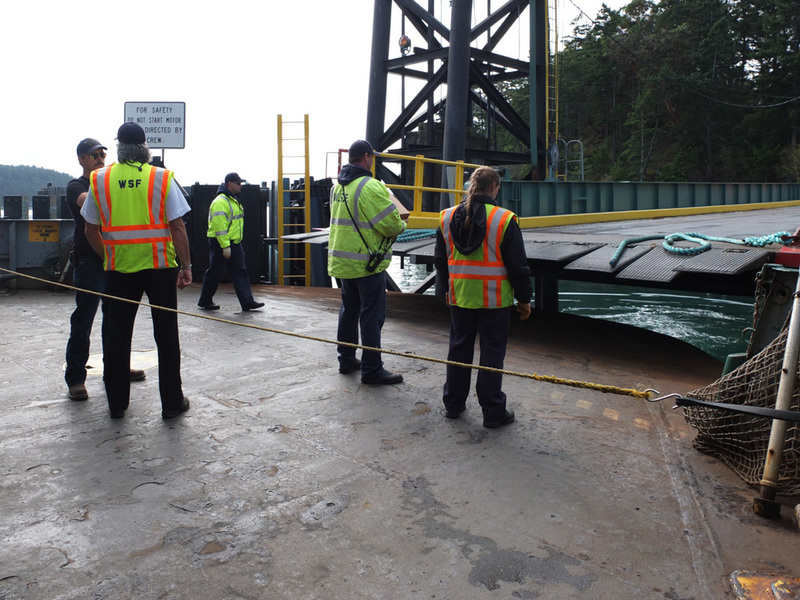 While not all LCLT residents are business owners, they bring similar entrepreneurial zeal to a variety of jobs—at the ferry dock and grocery store, as schoolteachers and doing construction. And although about ten percent of residents are of retirement age or older, many continue to work, not always out of necessity, well into their 70s and 80s. Sandra Mattingly-Paulen, grants specialist with the Catholic Campaign for Human Development, an organization that has funded LCLT in the past, maintains that while LCLT may be a land trust in name, it is fair to say that in many ways it has the economic impacts of a community development corporation. LCLT has indeed enhanced the quality of life for the greater island community in many ways that it often takes a discerning eye to see, as Sandy relates with this story of one Lopez Island newcomer: “This woman came to the island five years ago looking to buy property for investment. She told me, ‘you have this really amazing organic grocery store and a takeout restaurant I like. You have a world famous recycling center. I like the people I meet at the ferry and in the vineyard. Photo at the Lopez Island Ferry Dock courtesy Artur Cielielski. LCLT’s stated mission is not only to provide affordable housing but also to serve as a model for land stewardship. Its work extends deeply into sustainable agriculture and the rural development of the island. “LCLT is very unusual among CLTs across the country,” says Melora Hiller, executive director of the National Community Land Trust Network. LCLT raised the initial funding for the country's first Mobile Processing Unit. The Lopez Seed Library preserves GMO free seeds. Gardeners are encouraged to contribute and to take seeds from the library. Indeed, LCLT often finds itself in a role of incubating in the community. “Sometimes ideas float by and we say, 'well, we can try that,'” says Sandy. 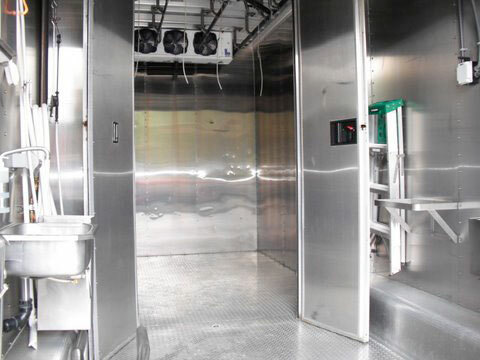 Seeing a need to better link the local livestock farmers with local demand for their produce and to reduce the stress on animals before they were butchered, LCLT raised the initial $300,000 in financing (funded by a combination of USDA and private grants) for the research and development of the country’s first USDA certified mobile processing unit. Now in its tenth year of operation, the MPU serves five counties and processes beef, pork, and lamb for 35 farmers of the Island Grown Farmers Cooperative. Last year LCLT sold the MPU to the farmers’ cooperative at the end of the ten-year term. 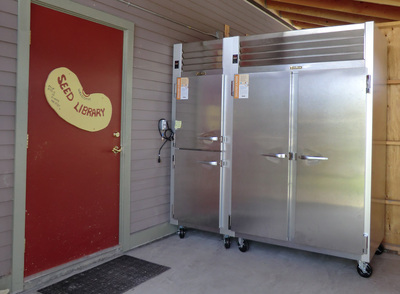 The $30,000 payments are made over six years and used to help fund the island’s Seed Library (see below) and other ag-related programs. “The MPU was an incredible thing that happened for the island,” Michelle affirms. “Before that existed the farmers had to haul their animals off island to the butchering facility and it was incredibly stressful for them. Having this mobile unit also saves the farmers a ton of money, and the animals are in their homes and on their pastures up until the day they are butchered.” Although the meat is shipped off the islands for packaging it is carefully marked and circulated back to the local community, supplying to local residents and csas, restaurants, and Blossom Grocery. Thirteen similar units now operate in North America and one of the original designers, Bruce Dunlop, owns and operates Lopez Island Farm and is a consultant to other communities wanting to develop mobile units. 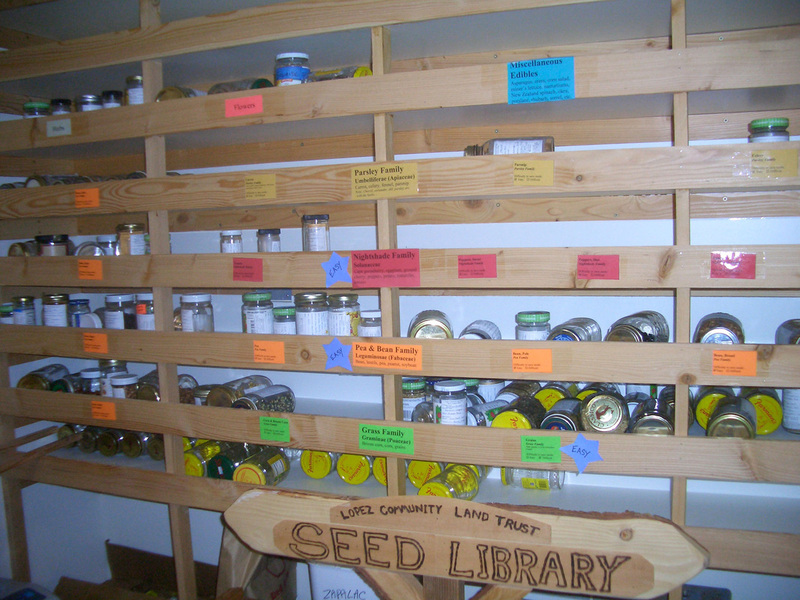 LCLT also publishes a Farm Products Guide to encourage support for island farmers, and operates a Seed Library to which home gardeners are encouraged to contribute and borrow. 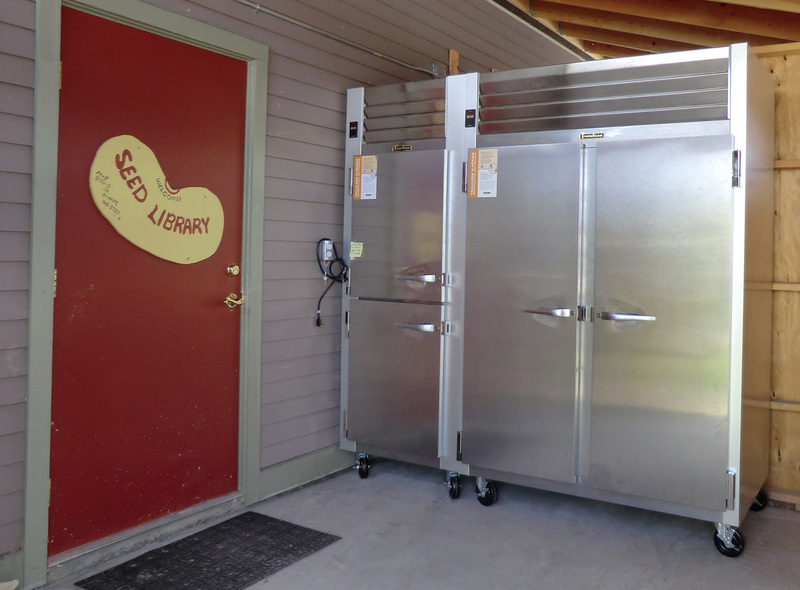 The library was established out of a concern to secure GMO-free seed for the island’s microclimate. With leadership from LCLT, and in collaboration with the Heller Family and the S&S Homestead Farm, the Lopez Island School District has also integrated a Garden and Farm program into its K-12 curriculum to educate children about the nutritional value of healthy organic foods and to teach them the skills they need to cultivate them. Morning construction circle at Lopez CLT provides an opportunity for trust- and consensus-building before the hard work of the day begins.